Protect yourself from the devil with a powerful Saint Benedict medal, which is one of the most precious and loved catholic sacramental medals. Many popes have enriched this medal with indulgences which protect the holder against epidemics, illnesses and against the spells and temptations of the evil. It also permits a good and Holy death as Benedict is also the patron of the Good Death. Shop our online collection of Saint Benedict rosary beads with free shipping. Great variety, styles and prices. Choose from wooden, glass or acrylic beads each unique in style and size. The Saint Benedict is recognized as a Father of Western monasticism and thus he is a Patron Saint of monks. In addition he is also a patron saint of students, those inflicted with kidney diseases, farm workers and civil engineers. 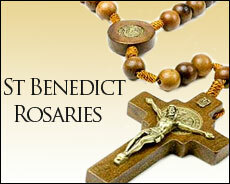 Each rosary features Benedict medal, a powerful sacramental with exorcism prayer on it. If you are interested in St Benedict life and the meaning of the medal please visit this site for more information.